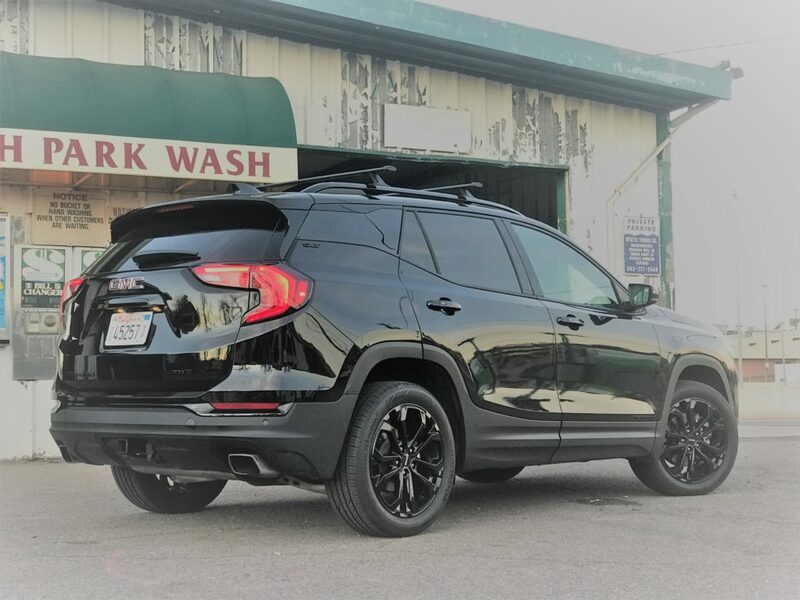 The SLT trim sits in the upper half of the Terrain hierarchy and starts off with a price tag slightly under $34k though big ticket options like all-wheel drive, an upgraded engine, and additional safety equipment quickly take the sticker beyond $40,000. It’s slightly higher than the Honda CR-V, Toyota RAV4, and Mazda CX-5 competitors. 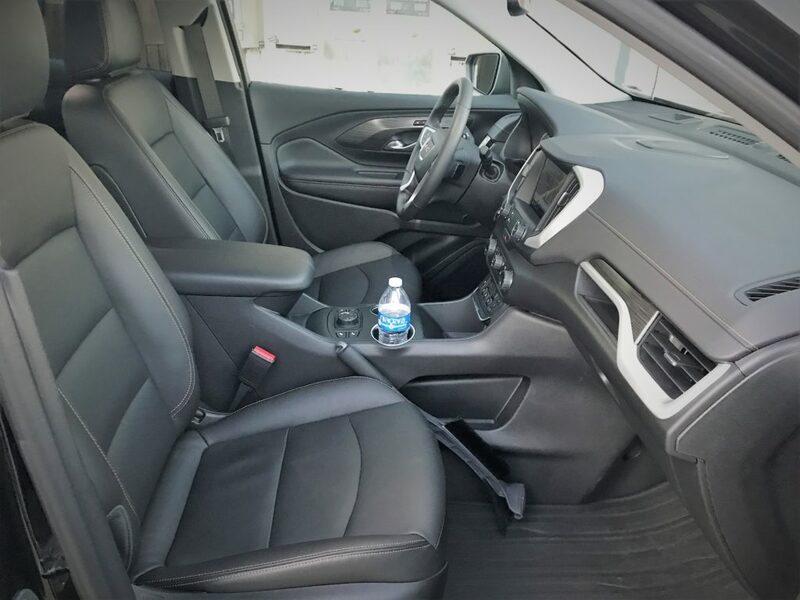 The Terrain includes enough features to add a layer of luxury and comfort with proximity entry with remote start, perforated leather seats with heating for the front seats, a heated leather steering wheel, an eight-inch infotainment touchscreen with the latest connectivity and navigation, and an HD rear camera are all included. A 4.2-inch digital display is tucked in between simply designed gauges. 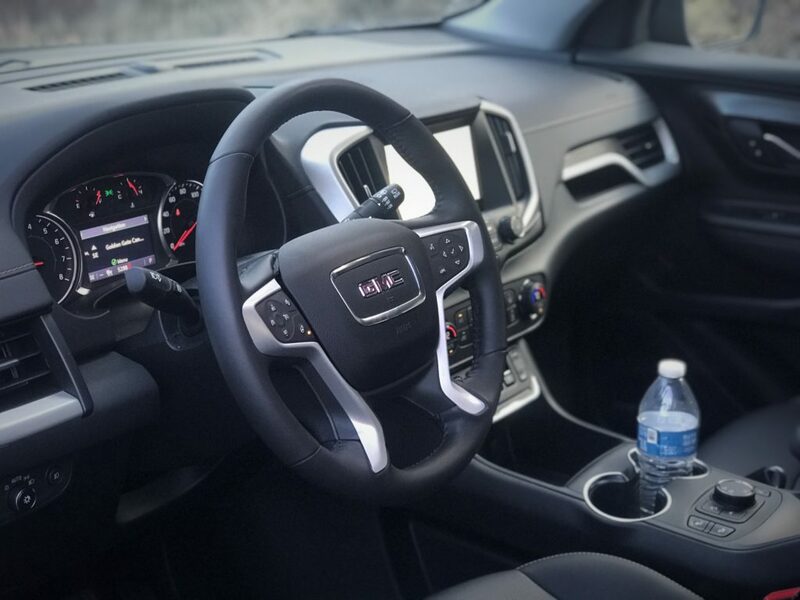 A motion power tailgate, auto-dimming driver’s exterior and interior mirrors are also included while LED headlights and cooled seats are reserved for the premium Denali trim. 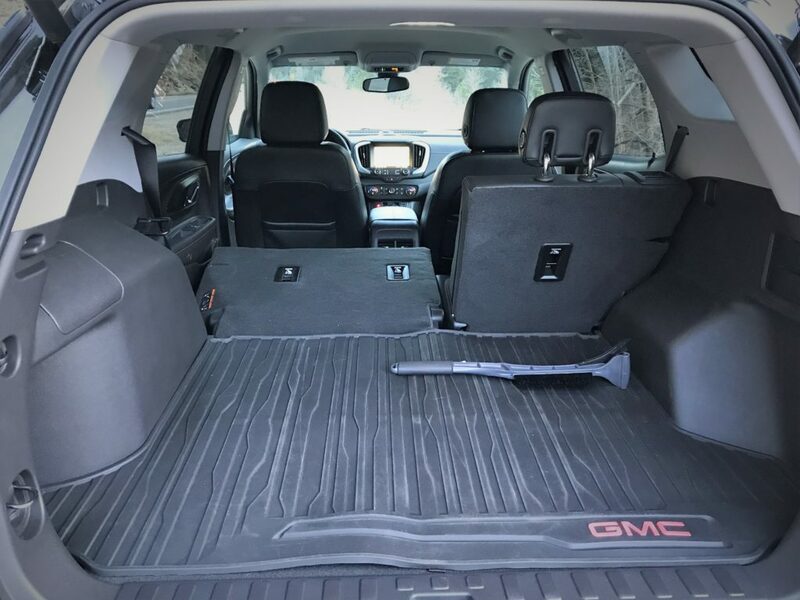 The Terrain earns top marks for occupant protection from NHTSA and IIHS with its well designed crash structure and plethora of airbags. 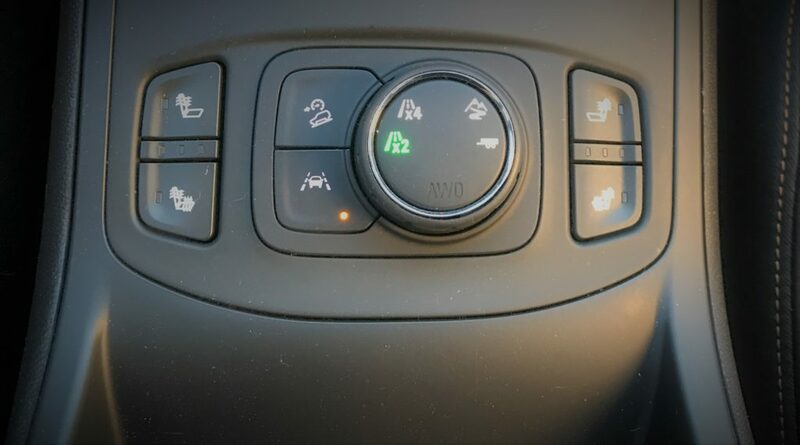 The active safety systems include automatic braking, full speed active cruise control, lane-keep assist, blind zone monitoring, and rear proximity sensors. In the Terrain, and other GM vehicles, vehicle alerts come via seat vibrations near the hip area. It’s adds information to your senses instead of causing a distraction with panic beeping. The auto-high beam HID projector headlights cast a long beam, though coverage is dim and IIHS noted significant glare. 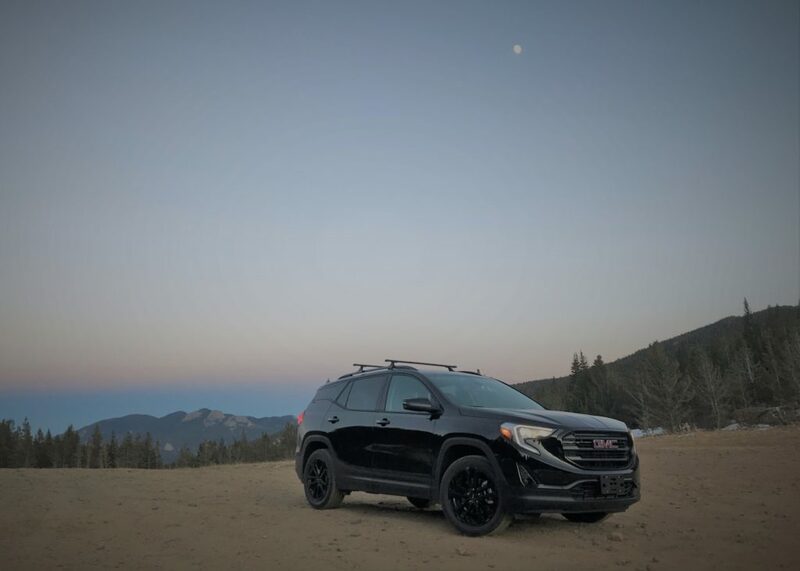 The current GMC SUV design theme is heavily represented in the Terrain. The large front grille is blocky and upright. The headlights are sharply cut and neatly integrated to provide a modern look. The no frills body side is distinguished with a window line that rises to a point then it falls to match the sloping roofline. It looks a bit forced as It doesn’t connect with the rear end but it is distinctive. The taillights carry the front light’s C-shape profile while rectangular dual exhaust outlets are nicely integrated into the lower fascia. Inside, panels are mostly wrapped with soft touch materials and feature a bit of contrast stitching. 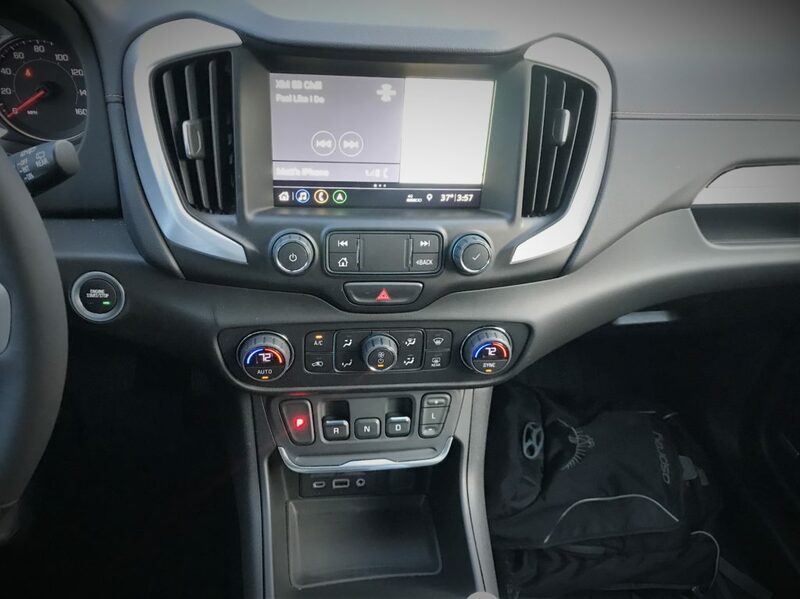 The dashboard is relatively low and generates an open feeling cabin with intuitively located controls, with the notable exception of the gear shifter. Instead of a lever or dial, the Terrain uses a combination of push buttons and rocking switches in a horizontal row. GM has used several different shifter layouts lately and this one is unlikely to make it to a second generation. The buttons are farther away and there is no distinction between the reverse and drive switch operations. 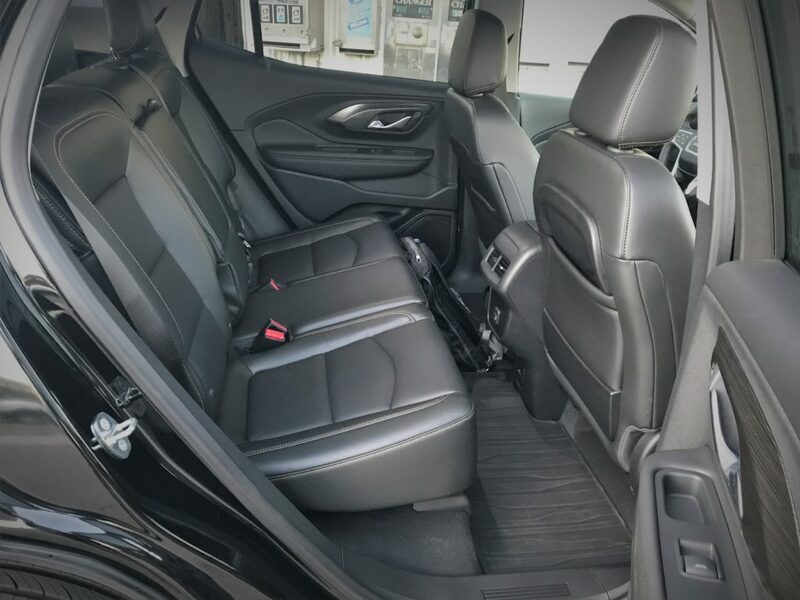 The rear seat passengers enjoy plenty of legroom, padded touch surfaces, HVAC vents, and power ports. Behind the second row is a reasonable 29.6 cubic feet though it’s far from best in class. The uprated 2.0-liter turbocharged four-cylinder brings significant power gains over the base 1.5-liter four and it behaves like a much larger engine. Power comes on smoothly and the turbo power is easy to modulate. The engine produces peak torque of 260 lb-ft between 2500 to 4500 rpm and makes quick work of passing other cars. Part of the accolades also go to the 9-speed automatic that seems know when to downshift or when to hold the gear and give the turbo a second to build sufficient power. 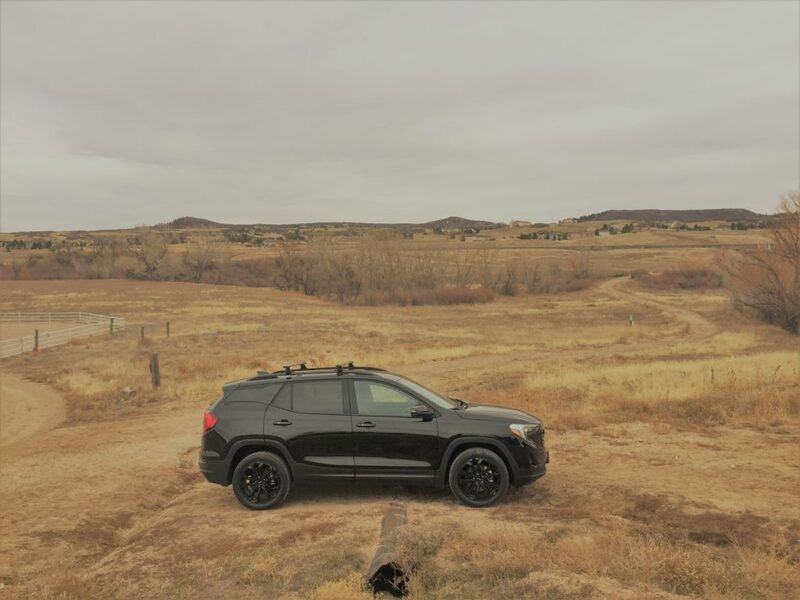 The drivetrain is less enthusiastic about hustling up and down mountain roads where the lack of high rpm power, turbo lag, and a vacuum cleaner exhaust sound combine with transmission gear selector buttons that are well out of reach. The all-wheel drive system is incorporated into different chassis control modes, including an AWD mode which partially engages the rear wheels when needed, an Off-road mode that keeps the system engaged and alters the stability control settings for maintaining momentum, and even a towing mode that improves control over this Terrain’s 3500 lb rating which is impressive for the class. A 2WD mode prevents any part of the all-wheel drive system from engaging even if the wheels slip. The advantage is a claimed improvement in fuel economy but the traction control system is rather heavy handed and abruptly shuts down power if wheel slip is detected. The EPA estimates the 2.0 liter and AWD powertrain will achieve 21 mpg city, 26 highway, and 23 combined. I achieved slightly better than 23 mpg during my time commuting in heavy traffic and winding around on mountain roads. 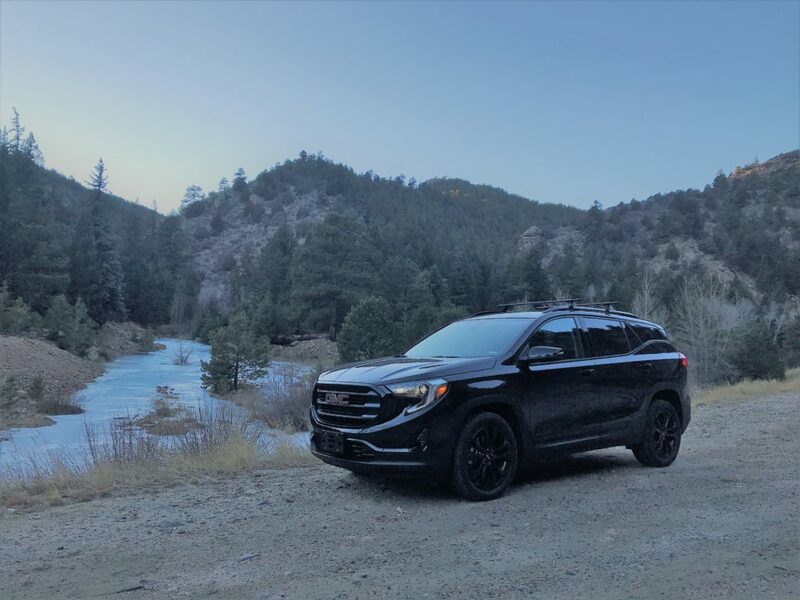 The GMC Terrain feels well isolated from what’s happening outside. The wind and road noise are kept to a minimum though a significant amount of drivetrain noise made it through, especially on cold mornings. Bumps are absorbed with a good sense of body control and smoothness, while dirt road ripples lead to some loud thunks despite reasonable speeds. Limited clearance angles also mean it’s unlikely to be the one volunteering for campsite scouting. When serving commuting duty, the suspension quietly soaks up bumps and its body motions are well controlled. The steering provides enough feedback for both easy highway lane control and accurate placement in sharp turns, but it’s not communicative enough to encourage a rapid pace in the twisties nor do the seats offer enough lateral support. 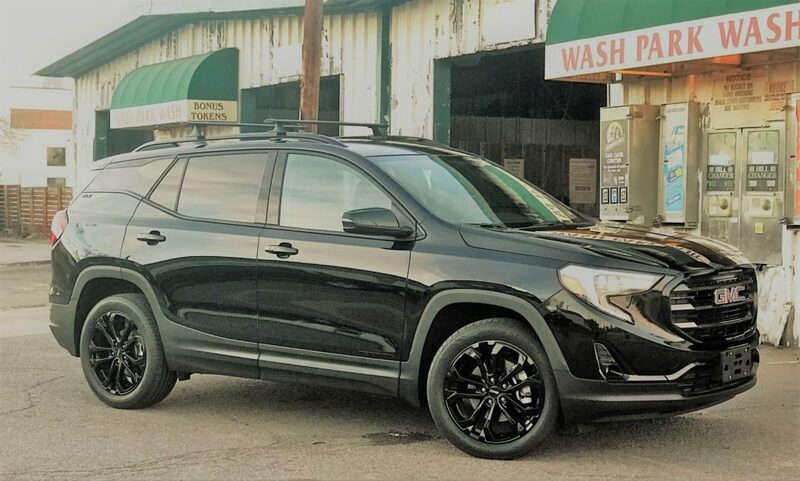 The GMC Terrain blends a blocky and modern exterior with soft interior shapes, though it isn’t unscathed by quality concerns. Though its towing ratings regain some of the truck cred, the off-road potential is hindered by the body’s limited clearance angles. 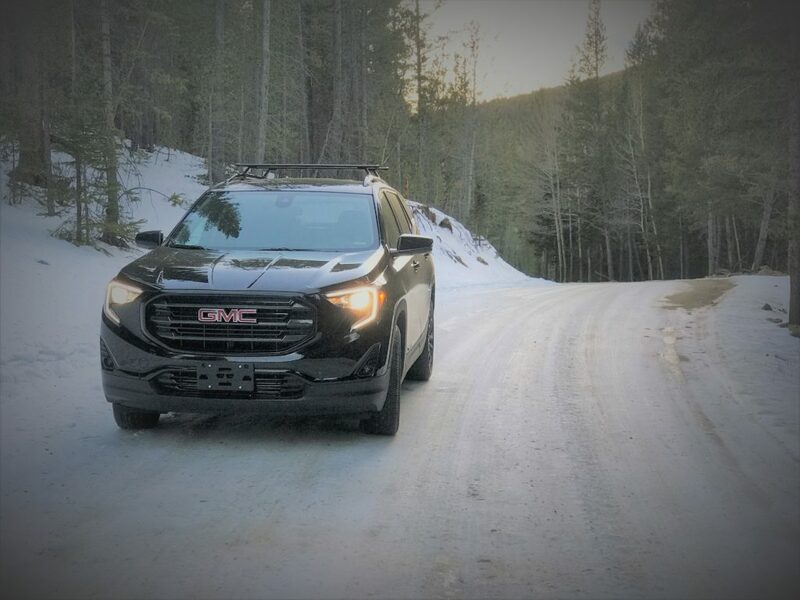 That is the life of the Terrain – it’s a mixed bag with more ups than downs and in the end, offers an authentic crossover from GMC.